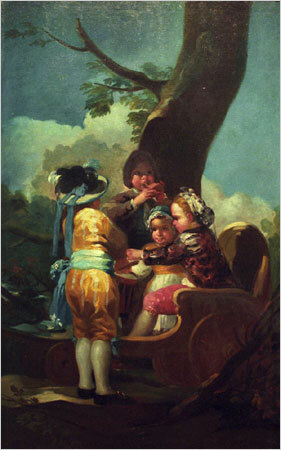 Saturday’s New York Times has an update on the theft of Goya’s “Children With a Cart”. As I said earlier this week, the market for this work is extremely small. Purchasers of the work will not be able to claim they acquired the work in good faith, and thus the Toledo Museum of Art will defeat the possessor’s claims. Of course, the thieves may not be concerned with selling the work, they may be trying to ransom the work back to the museum. The FBI is investigating the theft, and has not released any information to the public. It seems though, that as more time passes, the likelihood of a quick resolutions grows more remote. The Times piece has quite a few details of the theft, which it seems to have gathered from the insurance investigation and interviews with the proprietors of the Pennsylvania Howard Johnson. The painting was taken from the delivery truck overnight, after being parked in the motel’s parking lot. At this point, criticism has centered on the driver’s decision to stop overnight when they could have completed the drive in a day. Also, these works are not supposed to be left unattended. Whether this theft was an inside job as a number of commentators have speculated remains to be seen. It might just be an example of a couple of lucky thieves coming across this delivery truck at this Howard Johnson. Look for museums to increase the security procedures involving the transportation of valuable works of art in the future. Many museums depend on the income and prestige which comes with hosting large exhibitions like these. For the general public, it would be a great shame if this theft causes institutions to think twice before loaning their works to other museums. The New York Sun reported last night that a 1778 work by Francisco de Goya, Children With Cart, pictured here, was stolen near Scranton, Penn. It was being transported to The Guggenheim for an exhibit on Spanish Painting. The FBI is investigating, and has offered a reward of $50,000. The painting is valued at about $1.1 million. The work had been housed at the Toledo Museum of Art in Ohio. It looks to be from his earlier career, before the lead in his paint may have caused his deafness, which resulted in some fantastically-bizarre works. Why was this work stolen? Surely, the market for the work is quite small, as nobody will be able to claim good faith in buying or selling the work. The thieves may be attempting to ransom the work back to the museum. Criminal penalties are far lower for kidnapping a work of art than they would be for, say, kidnapping a person. The other possibility is that a wealthy collector may have requested it stolen for her own private collection. Some have termed this hypothetical theft-on-demand the Dr. No possibility. If the work is returned, look for it to gain in notoriety.